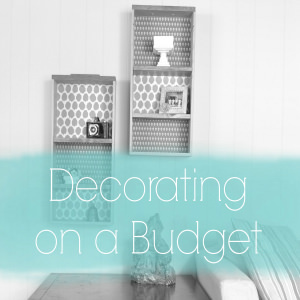 I’m excited to be participating in another round of the One Room Challenge, where bloggers and designers update a room in their homes in just 6 weeks. I’ve joined in for a few other rounds, and every time I’ve thought about tackling this room but could never pull the trigger. 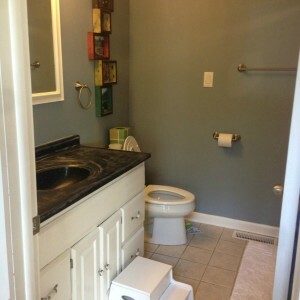 Here’s a look at how a few of these others rooms looked before I gave them an overhaul in the One Room Challenge. 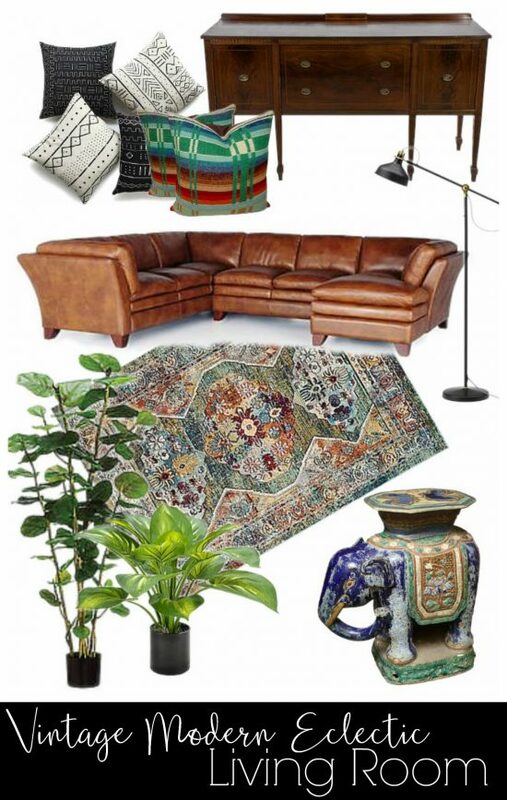 This round, I’ll be updating my living room. It’s basically the room of forgotten projects. I’ve been waiting to give this room a makeover for 14 years, for as long as we’ve lived in this house. It’s the largest room in our home, and one of the places where we spend a great deal of time. But, to be completely honest with you, I’ve been terrified to take this one on. Let me show you why. This room contains the only wall in our entire home that hasn’t been painted, and it’s quite possibly the wall that needs to be painted the most! This wall is precisely why I’m so scared. It’s been easier to just design around this ugly red wall than to do anything about it, but I’m done making excuses – this red wall will be gone! 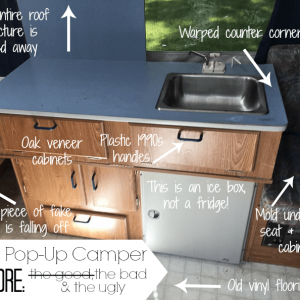 Throughout the years of living here, I’ve brought in quite a few different pieces of furniture, rugs, and small decor items, but because I never had a vision for the space, it became a hodgepodge of a mess. I do know that I plan to keep the vintage sideboard that we’re using as a TV stand. 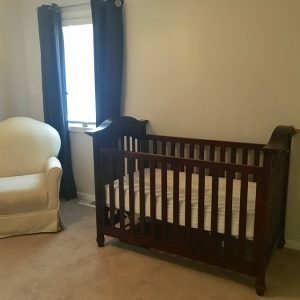 I have three young girls, and this room serves as a playroom as well, so I need to find a solution to contain their most used toys and games. 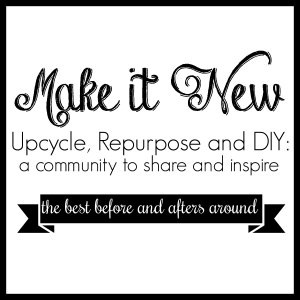 I have an idea, but I need to make sure I can get my hands on the vintage pieces I’m envisioning. Oh yeah, and that corner to the left of the sideboard is just screaming out for a collection of plants! I picked up the leather sectional on Craigslist a couple of months ago to replace our cheap, broken, old couch, so it will also be staying in the room design as well. The cabinet in the corner has been waiting to be refinished since I bought it two years ago, and the gateleg table is also in need of an update. 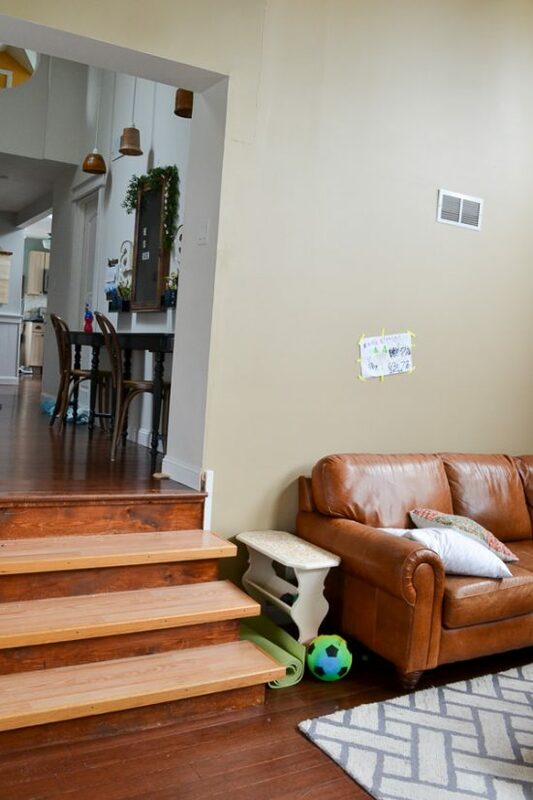 The staircase clearly does not match our flooring. We had that light laminate wood in our home when we moved in, but then about 6 years ago we installed hardwood throughout the entire house. Because we did it ourselves and it was quite the project, by the time we finished I was DONE with flooring and told myself I would finish the stairs soon. Well, 6 years wasn’t really the time frame I had in mind, but now it’s definitely time to make these stairs match with the rest of the house. Although I’m still a little nervous to tackle this room (especially that red wall), but I’m SO ready for it to be finished! Here’s a rundown of what I plan to complete. Basically, I’m going bright and happy in this room with tons of greens and a mix of colors from vintage goodies. First thing is first: I need to go paint (and paint, and paint again) a very large red wall. 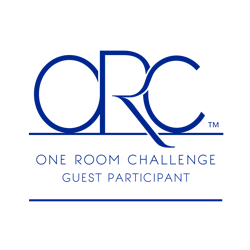 Be sure to go check out all the other participants in this season’s One Room Challenge! Such a great space to work with! I just love the beams, I can’t wait to see how it turns out!! what a wonderful space! so much light excited to see it turn out. This room gets SO much light. It’ll be a fun one to transform! 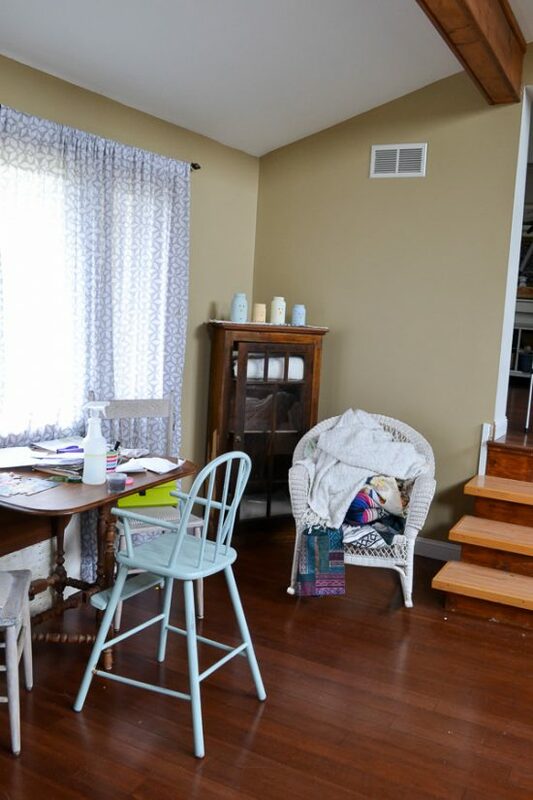 This is such a lovely space to work with, Jenny! Those high ceilings are awesome. Can’t wait to see what paint you go with to replace that red wall :). Look forward to following along. Good luck! I think I’m going boring and white (but adding in a ton of color with artwork). Of course, I had to pick the hardest color to cover red, right?! Excited to follow along! The room has great bones and I can’t wait to see you add to it! What a great space you are going to have! I can not wait to see it come together. That’s my favorite part about the ORC finished spaces that you can finally enjoy the way you intend!! Yes, exactly right! If not for the ORC, I’d never finish anything! What great lighting and bones you have going on here. This will be fun to see it transformed. It really does have good bones, and I can’t wait to tackle it! Oh my! That is a very tall wall! I love your mood board and can’t wait to see how your room turns out!! Right? It doesn’t help that I really don’t like heights, either! 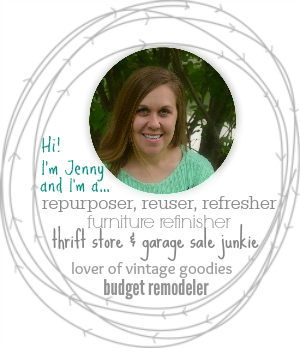 Jenny – your ceiling height is amazing! We love your design plan. Tugging at our heartstrings with grandpa’s gallery wall – so sweet and endearing! We know you will rock this challenge! I love your inspiration board! That is a gorgeous sofa and rug perfect for a family room. Looking forward to following along this season! Thanks Jen – I’m looking forward to this one! Love all the windows, and looking forward to seeing your progress! Aren’t those windows great? We’re so lucky to have them. Thanks for following along! Gorgeous design and what a wonderful space to work with! Thanks Joy – I’m excited to get started! You’ve got a great space to work with! 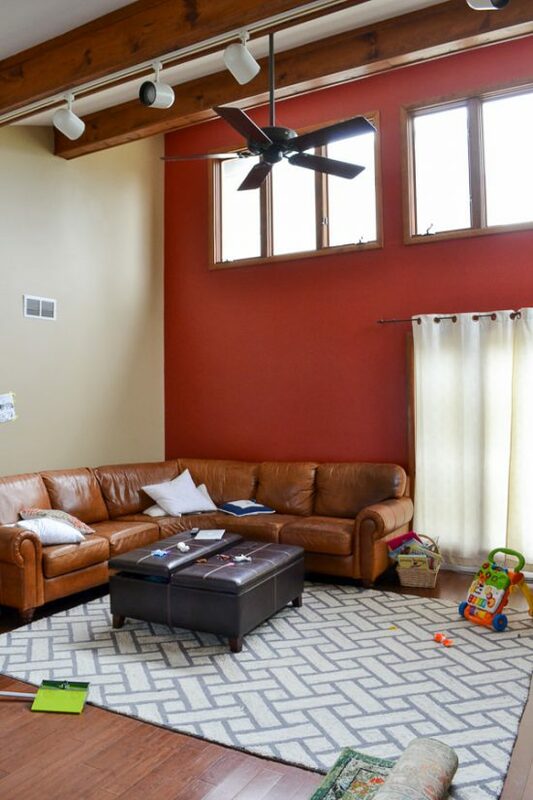 I love the vaulted ceilings, and can’t wait to see your plan come to life! Thanks Joan! I’m ready to take this one on, finally! That’s so nice of you to say, CoCo! It’s all about positive mindset, right? Thanks for the encouragement! You have a great space to work with with lots of natural light. Excited for the reveal. It really does have some potential. I hope I can do the room justice! Great ceiling height and lighting in here. We have 9-foot ceilings, and the extra foot makes a big difference—but I’d absolutely love a big great room with sky-high ceilings. 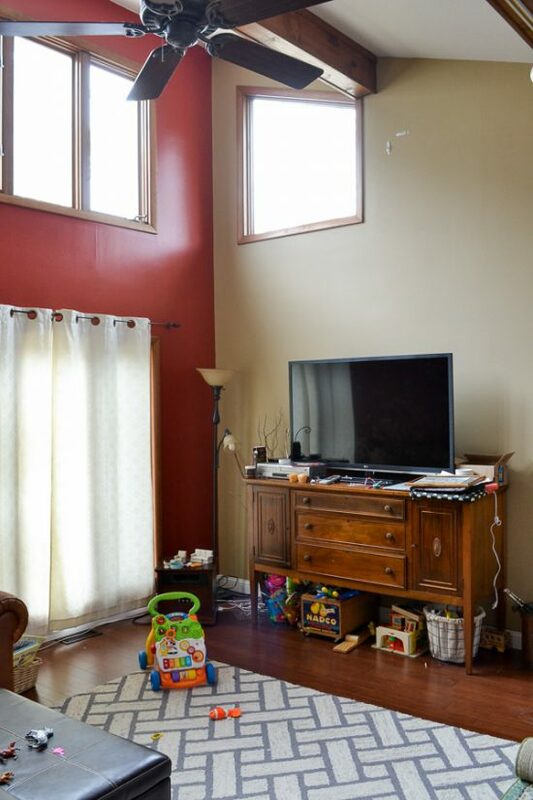 Thanks – we love all the natural light!! Wow, such a great space and I love your vision!